Crossover Audi SQ7 TDI — diesel rocket. 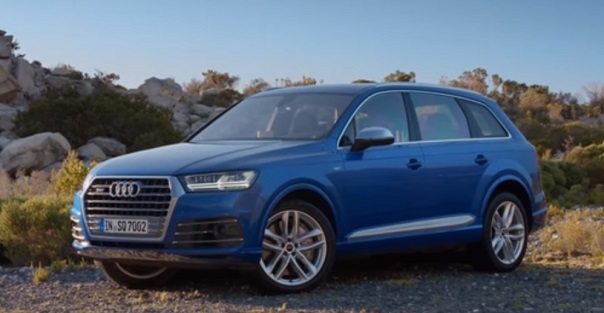 New Audi SQ7 TDI 2016-2017 year — photo and video, price and packaging, specifications of the most powerful serial crossover with a diesel engine. 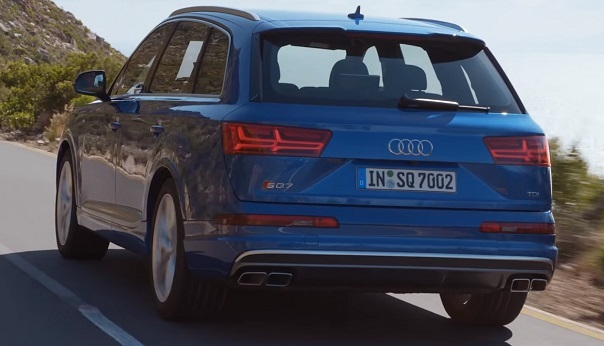 The official premiere of the new diesel SUV, the Audi athlete SQ7 TDI with 435-horsepower engine and an electric supercharger was held at the Geneva Motor Show in early March 2016. Sales trends in the homeland of Audi AG in Germany start in April for almost 90,000 euros for the basic package. Buy a new crossover from Audi diesel model SQ7 TDI in Russian motorists will be in November this year. We begin our review with specifications Audi SQ7 TDI 2016-2017 year. In the engine compartment of a novelty established a unique eight-cylinder diesel engine, is equipped with a supercharged electric — electric powered compressor (EPC) supplementing the two regular turbine and valve control system — Audi valvelift system (AVS). Such a set of super modern systems provide phenomenal performance engine: V8 4.0 TDI outputs (435 hp and 900 Nm) and is mated to a 8 automatic Tiptronic, drive, of course, full of quattro. Dynamics diesel crossover acceleration curb weight under 2400 kg from 0 to 100 mph is just 4.8 seconds, top speed is electronically limited to 250 mph, declared by the manufacturer in a combined fuel consumption of 7.4 liters motion mode. Available polnoupravlyaemoe chassis, adaptive air suspension, suppression system rolls with electric motors for the front and rear stabilizer individually controlled. Power boost electric motors and lateral stabilization system is performed by an additional 48-volt lithium-ion battery pack installed in underground luggage. The main 12-volt car system and an additional 48-volt charging system obtained from the generator with high performance. 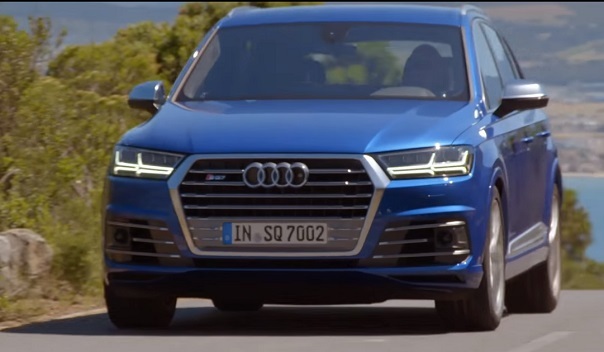 External dimensions Body Audi SQ7 TDI 2016-2017 year are somewhat different from the basic model of the crossover Audi Q7 and up 5069 mm in length, 1968 mm (2212 mm rear view mirrors) in width, 1741 mm in height, with 2996 mm wheelbase and ground clearance 140-235 mm. With the standard established by 20-inch wheels shod in tires 285 / 45R20 track front and rear wheels — 1679 mm. External differences sprinter diesel Audi SQ7 TDI from Audi Ku7 conventional versions are reduced to having a slightly modified false radiator grille and bumpers, rearview mirror housings and moldings on the doors made of aluminum, dual exhaust system and trapezoids magical SQ7 letters on the front and the rear of the crossover. Shop top-end diesel version of the German crossover comfortable and luxurious. By request of the buyer five-seater with two rows of seats or seven-seater with a third additional nearby. Luggage compartment 5-seater version is able to take, depending on the position of the backs of the second row from 805 to 1990 liters of cargo. Trunk 7-seater version of the third-row backrests accommodate 235 liters, with the backs of the second row of 705 liters, and subject to the addition of the third and second seating rows of 1890 liters.